Savage Garden were an Australian pop rock performance and song writing duo. Darren Hayes (vocals) and Daniel Jones (keyboards, sequencing, guitar) formed the group in Brisbane, Queensland in 1994. Their international success occurred between 1997 and 2001, including number one hit singles with "Truly Madly Deeply", "I Want You", "To the Moon and Back", "The Animal Song" and "I Knew I Loved You". 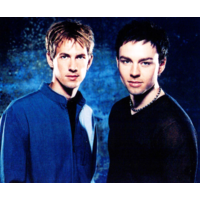 Their first two albums, Savage Garden and Affirmation reached number one in Australia and peaked into the top ten in both United Kingdom and United States. The group won a record number of ten ARIA Music Awards in 1997 for their debut album and its related singles. The band took a hiatus in 2000, and while they originally intended to reform, Hayes announced its break-up in 2001.